Where Is the Best Place to Visit the Great Wall of China? This is the eastern terminus of the Great Wall, reaching into the sea. It is about three hours by train from Beijing. 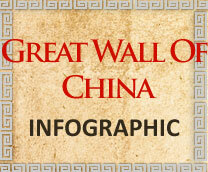 Beijing was the capital of the Ming Dynasty. The wall was especially fortified here. It has been maintained well over the years and is a leading tourist destination. Tourists are intrigued by the outer and inner walls of this section on the Yellow River. Several sections of the wall here are of special interest. Sites include Water Cave Gully and Hongshan Castle. Visitors can see a historic garrison headquarters, oasis town and Lanzhou (capital of Gansu Province), which once was walled. Special places of interest along the Great Wall are many and various. Not to be missed is the Great Wall Museum in Badaling. Exhibits and artifacts provide details of the wall’s history. Another must-see place of interest tourism sight is the Terra Cotta Warriors and Horses exhibit at Xian in Shanxi Province. It displays carved figures more than 2,000 years old. Natural attractions are impressive throughout northern China. Visitors to the Great Wall may see a diversity of wildlife. Animals include deer, bears, weasels and pikas. Travelers may even catch a glimpse of a panda. Hundreds of bird species, migratory and year-round, inhabit the region. Plant enthusiasts will be interested in the variety of trees, shrubs and herbs. The Chinese for centuries have derived medicines from many of these plants.